This guide is for last year's Halloween Event. You can find the guide for this year's Happy Halloween event by clicking here. The first special event for the International version of the game is finally here for Halloween! We have put together this page to help explain the event and give some helpful tips and tricks about how to win the event! To start the event you have to select the event "card". This is done the same way as selecting a Bingo card by pressing the cards button in the lower left hand corner of the Weekly Ranking Screen. 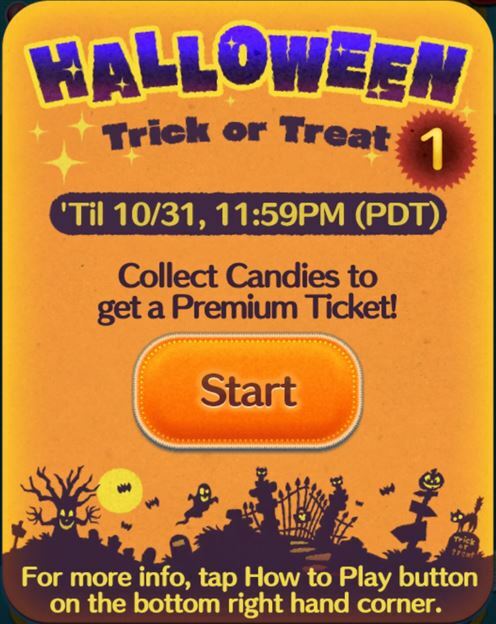 Once you click that then if you are currently playing a bingo card you can click the button in the lower left that says "Halloween Trick or Treat" to switch to the event card. Once you do that, if you haven't already started the event card you need to click the big Start Button on the card. There will be three different cards during the event. The first card is of course available today. The second card will be released October 16th and the final card will be released October 23rd. The event will end the night of October 31st. If you complete all three cards you will get a special Jack Skellington "Sandy Claws" Tsum Tsum! Once you have started the event and are playing with the event card, some of your hearts with randomly be "Pumpkin Hearts". When you play a game using a "Pumpkin Heart" (the left most heart on your hearts list is the heart you use to play that game) at some point during the game a giant pumpkin will appear! 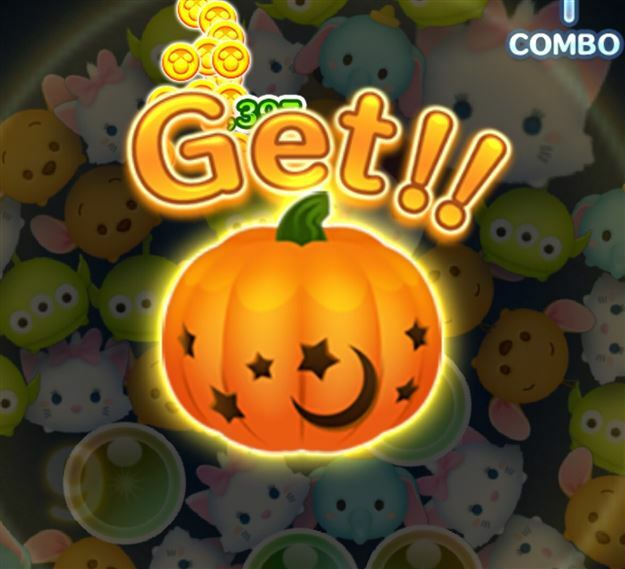 Once the pumpkin appears you need to pop magic bubbles next to the pumpkin or hit the pumpkin with a Tsum Tsum's skill three times in order to get the pumpkin. 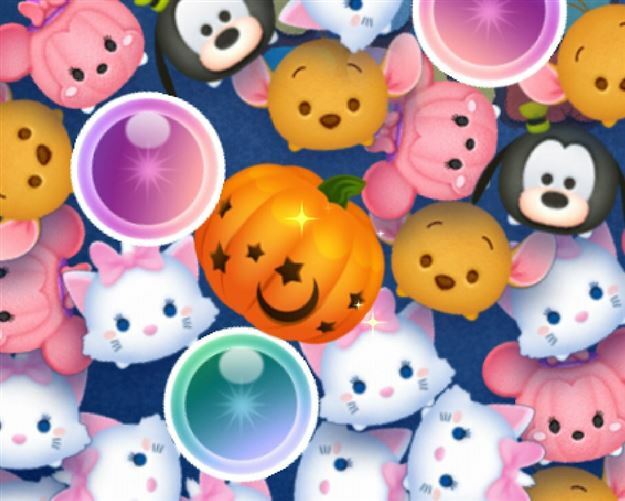 Hitting it with a Tsum Tsum's skill means using a Tsum like Stitch and having the pumpkin be in the area that the Tsum Tsum's skill would clear. 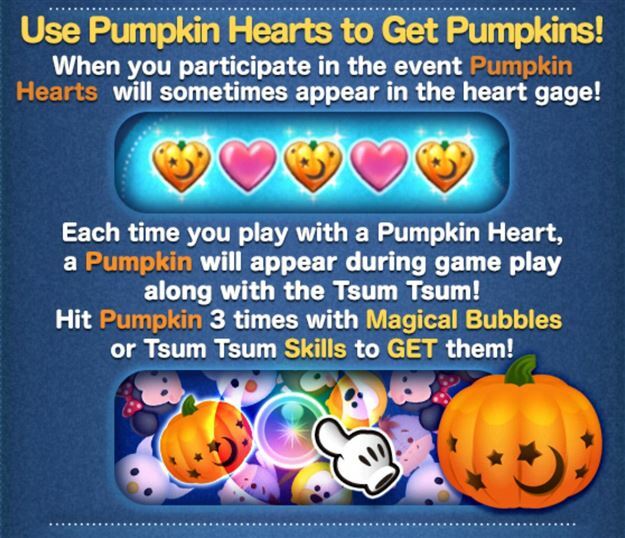 Once you have hit the pumpkin three times with a magic bubble or your Tsum's skill you will get the pumpkin! Once you have collected the pumpkin you just play the rest of the game like normal; however, once the game is complete you will get to see what was inside your pumpkin. The main thing you want are candies but other random things like coins or item tickets (+Coins, 5->4, +Bubbles, +Time, etc) can be in there instead. 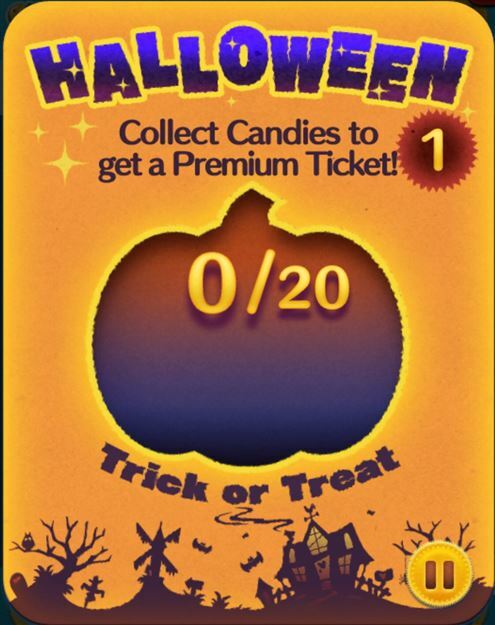 Each time you collect a candy it will be added to your Halloween Event card and once you get enough candies to fill the card you will get the prize for that card! Use Marie or Miss Bunny as your Tsum during the event if you have them. Since their skill creates magic bubbles it makes it very easy to hit the pumpkin three times with a bubble. If you have a lot of friends who send you hearts constantly you probably have a ton of extra hearts. Now is when they become really useful. If the left most heart on your heart list is not a pumpkin heart you won't get a pumpkin while playing. To "skip" past this normal heart you can start the game, hit pause, and then click the "Try Again" button. This will take you back to the game start page and that normal heart will have been used! Do you have any other tips or tricks for the event? If so, let us know in the comments below and we can add them to the list! 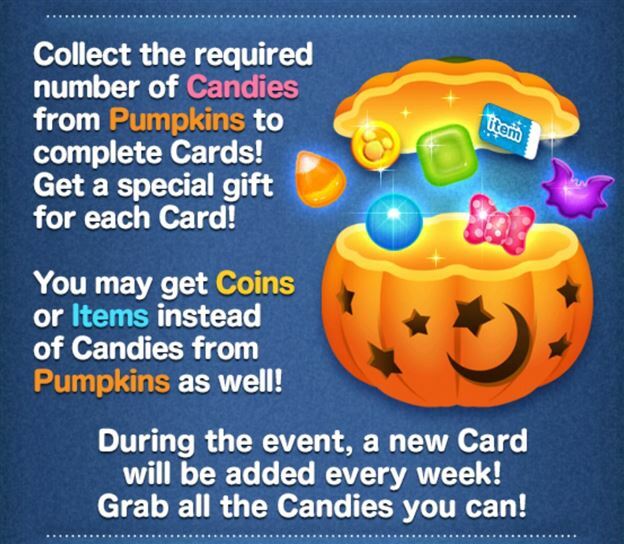 Discuss the Halloween Trick or Treat Event!